X-TREME LOW PROFILE:Less bulk but all metal strength. If your carry method is appendix, you need to consider this belt style. 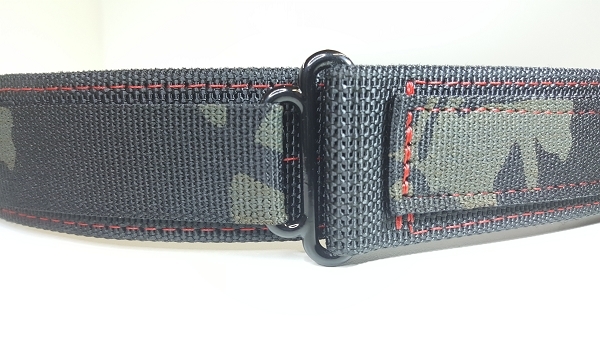 1.5'' Stiff Nylon Webbing:Two layers of high quality made in the USA nylon webbing sewn together with bonded nylon thread of your color choice. For our belts, your pant size IS NOT the measurement we need to build your belt. By checking this box, you are confirming that you verify your waist measurement is correct. The dominant feature of the belt is the extreme low profile when compared to belts with other fastening/adjustment systems. If you appendix carry for your EDC, this is a belt well worth your consideration. Constructed using our stiff MADE IN THE USA 1.5'' base webbing, this belt design combines a minimalist footprint with rock-solid stability. When compared to other low profile EDC belts available in the marketplace, the clean and neat appearance of this belt stands out against competing offerings from other manufacturers. This is an original design and we are proud of it! The closure system includes two sets of hook and loop. 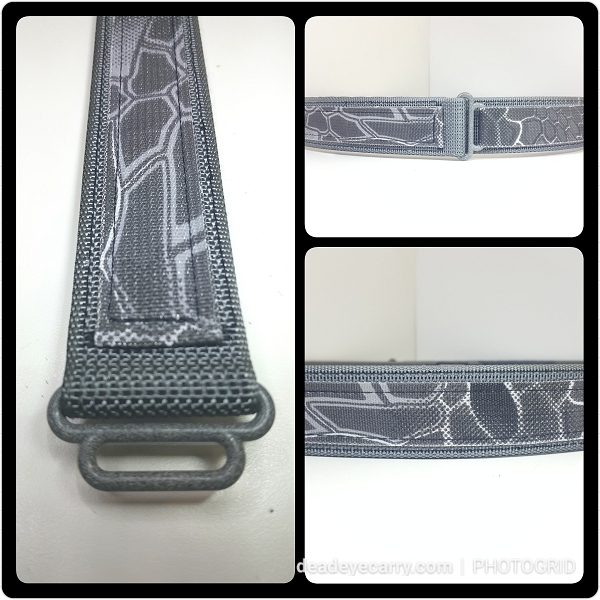 The 1.5'' base webbing secures to itself in the area of overlap and the 1'' accent webbing threads through the metal reducer and wraps back and secures to itself on the outside of the belt. When worn for EDC we believe it is the most stable platform for any type of holster choice. This belt excels at AIWB, but is equally at home on the range using a OWB holster or carrying to the supermarket IWB. This belt can literally do it all! Add to that all of the options available for accent webbings and thread colors including... 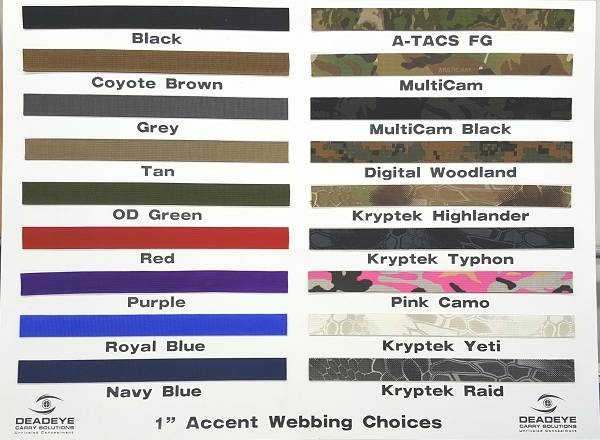 Solid colors, camo prints (like Kryptek-Typhon and Multicam) and a wide selection of thread color choices and it's a WIN-WIN-WIN buy for the consumer. Don't see a thread color or accent webbing choice that you like? Send us a message and we will try to accommodate. Are you in need of a belt? Search no further! I've owned several belts from some of the "leading manufacturers" over the years! However, I couldn't be any more impressed with the belt I received from Bob at Deadeye Carry! The turnaround time, quality and price made this purchase a no-brainer! It rivals any belt I've ever owned for concealed carry at a fraction of the price! Fit and finish are INCREDIBLE!!! Bob has a customer for life! And, his customer service was literally the "icing on the cake!" Again, don't take my word for it! ORDER NOW!!! You will not be disappointed! I wish I had known about this belt before. The belt works excellent with OWB and IWB holsters. I conceal carry a Shield .45 in a paddle holster and this belt will not twist at all. Not even with a fully loaded and heavy .45. My only regret was not to have spent a little more money and getting the belt with the AustriAlpin buckle! It would just make it easier to put on. I love this belt and I highly recommend it! I had been through several "gun belts" but was never satisfied with shifting and pulling my iwb rig. I stumbled on dead eye and I'm glad I did. This belt has changed everything about my edc. No more shifting or pulling, you put your rig in and it stays put. It takes a couple days to learn the sweet spots for what will work for you. The quality is exceptional and I've never had customer service like I have from dead eye. I will be buying another belt from them in the near future. I have two of these belts in different lengths (for different pants & where they sit on my hips/waist). I love them. This belt is awesome! I have been looking for a good non leather gun belt for a long time. After many months of searching I finally came across the DeadEye carry website and am I glad I did. The belt quality seems to be second to none, and their customer service is outstanding. 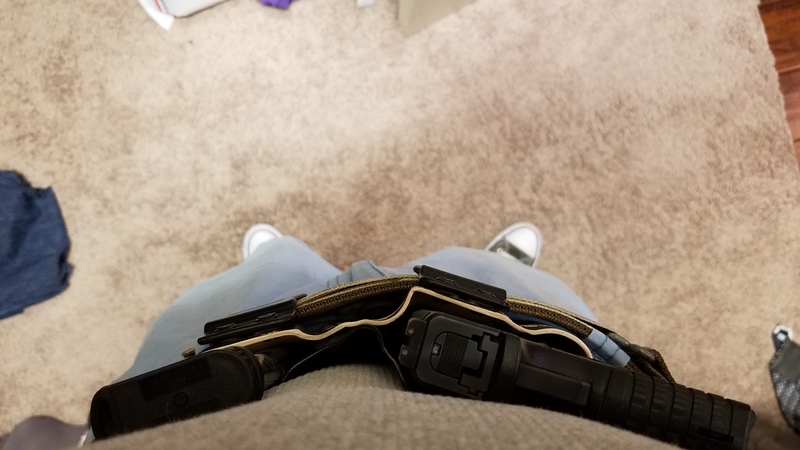 When I ordered the belt I was a bit confused on measuring for the perfect size and when my belt arrived it was a little big and wouldn’t hold up my pants when loaded down with a weapon and extra mag. I contacted DeadEye and explained my situation. They said send the belt back with the correct measurement. I did. And they fixed the problem no question asked. I plan to buy the hybrid cobra buckle belt soon. Q: Are there any videos on how this belt system works? There currently is not, but we know it needs to happen. I'll put something together and get it posted. I'll provide a link when complete. I'll work on this over the coming weekend. and hope to have that posted early next week.